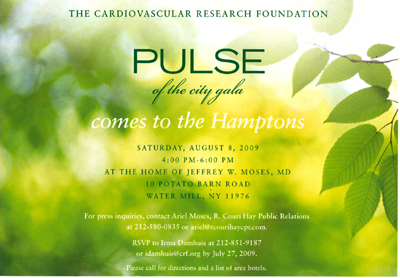 The Cardiovascular Research Foundation will honor Martin B. Leon, MD at the first annual Pulse of the City Hamptons Kickoff on Saturday, August 8th, 2009 at the home of Jeffrey W. Moses, MD. The cocktail celebration will take place from 4pm to 6pm to raise awareness for the Cardiovascular Research Foundation’s annual fundraising gala, Pulse of the City, which will take place this year on Thursday, October 22nd, 2009 at The Waldorf Astoria in NYC. The Cardiovascular Research Foundation is an independent, academically focused non-profit organization dedicated to improving the quality of life for people with cardiovascular disease through research and education. Individual tickets are $150, and Junior Committee tickets are $75. Irma Damhuis at (212) 851-9187 or at idamhuis@crf.org.